140 Characters from DollarApp is an app that positions itself as a “style guide for the short form.” The short form in question is Twitter, where each message is limited to—you guessed it—140 characters. The app’s author, Dom Sagolla, was involved with Twitter from its infancy, co-creating the microblogging service. Twitter Tips: A companion app to the book of the same name, 140 Characters adds some mobile-specific features like a built-in browser and mini Twitter reader with updated tweets from the people discussed in the book. 140 Characters covers the basics of Twitter usage, while spending the most time concentrating on how to get your message across in such a limited amount of space. Sagolla breaks up his suggestions into chapters, and covers areas such as adding value, simplifying your thoughts to fit the format, things to avoid, and how to cultivate followers. Each topic is discussed at length, and highlighted by a variety of examples that fit the points being made. 140 Characters is the companion app to the book of the same name by Sagolla. 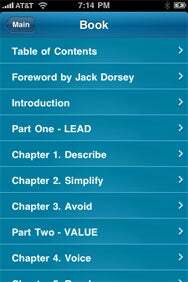 The app acts primarily as the electronic version of the book, which makes it easy to jump from chapter to chapter and follow links within the built-in browser. You’re also provided with links to online clips of the author discussing Twitter, as well a mini Twitter reader that shows updated tweets by many of the people that are discussed in the book. With the growth that Twitter has seen in the past few years, there are sure to be new people every day that are looking to take part. They may overwhelmed by the process and looking for a place to learn not only how Twitter works, but how they can effectively communicate their thoughts and engage people in such a limited amount of space. 140 Characters may be very helpful for those people. Personally, a lot of the advice contained in the app struck me as too long and drawn out. For an app that’s teaching the short and concise nature of Twitter, some of the sections felt the opposite of that. Learning how to use Twitter from an app like this may not be for everyone, but if you’re looking for a guide to craft your words to fit the Twitter form, 140 Characters is a good place to start.